Looking for Oki MB760 & MB770 MFP Series Parts? Leasing Available from $40.06 per month! Leasing Available from $75.22 per month! Leasing Available from $14.59 per month! Leasing Available from $21.89 per month! Improve your bottom line, take control of your output, and enhance your workflow. Help protect the environment, too. 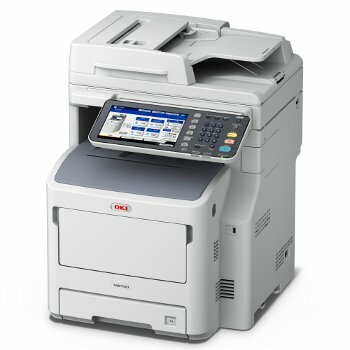 The OKI MB760/MB770 Mono MFP Series combines high-quality output and four-in-one functionality with speed, reliability and ease of use- superior value from MFPs that have a footprint small enough to fit easily into your environment. They're the perfect solution for your company-'s medium-size workgroups. Their duplexing/reversing automatic document feeder (RADF) quickly scans both sides of a document. And, with their robust duty cycles, these durable devices can be relied upon to handle large daily print and copy volumes. Scan at the machine or from your desk - Turn hardcopy documents into electronic files with multiple options. Scan color or black & white documents in, and send them to your PC, a network folder, a USB stick, or to a list of e-mail addresses. The convenience of E-Filing- Store your digital documents on or transfer them from -boxes- on the MFP's secure hard disk drive. Users have walk-up-and-print or pull-down (to their PCs) access to all documents in the public box, or access via password to documents in private boxes. Passwords can be assigned to specific users or shared within a department. Full-featured fax - All models have a robust Super G3 fax with Dual Access, T.37 Internet faxing, a 3,000-entry address book, double sided fax scanning, and the ability to let you send faxes directly from your PC. They can make your job easier - The MB760/ MB770 MFP Series is user friendly: network ready right out of the box, with an intuitive operator panel that's simple to use: a 9" color touch-screen graphic display, an alphanumeric keypad and function buttons. Your investment just keeps looking better and better. Monitor and control your printing - OKI Print Job Accounting software allows you to restrict printer access to individuals or groups, and to manage printing within defined cost limits. It provides you the ability to report on usage across the network, capturing information on volume, paper size, media type and consumables usage. ENERGY STAR compliance - their lower power consumption- especially in Deep sleep mode- earn these MFPs the government's recognition for energy efficiency. OKI's smart Extendable Platform offers demanding users solutions that optimize and simplify document processing and workflow. This flexible architecture allows software developers and OKI Solution Partners to create customized MFP solutions to meet specific business needs. Users can increase the efficiency of their processes through a host of business applications. The web interface of the MB760/MB770 MFP Series lets users interact directly with these web-based applications via the touch-screen on the operator panel. And, as new applications become valuable to your business, they can be added to your MFP's feature sets using embedded OKI smart Extendable Platform technology. 3 MB770 Series only. Declared yield in accordance with ISO/IEC 19752. 18,000- and 25,000-page cartridges also available. Max Scan Area: 8.5" x 14"
RADF Capacity: 100 sheets max. 1 Published performance results based on laboratory testing, letter-size sheets. Individual results may vary. 4 Declared yield in accordance with ISO/IEC 19752. Units ship with 10,000-page -starter- toner cartridges. 5 Based on 3 pages per job, simplex.